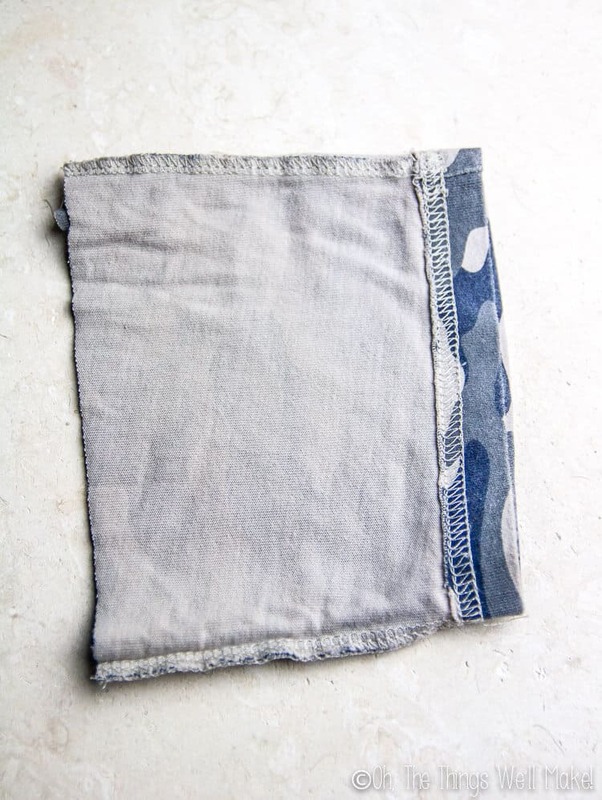 Easily make a drawstring bag in less than 10 minutes by upcycling old t-shirts and taking advantage of the hem. You can also make a pouch from the sleeves. The easy drawstring bag/sleeve to pouch concept isn't a new one to my blog, but it is a basic trick that I use quite often. 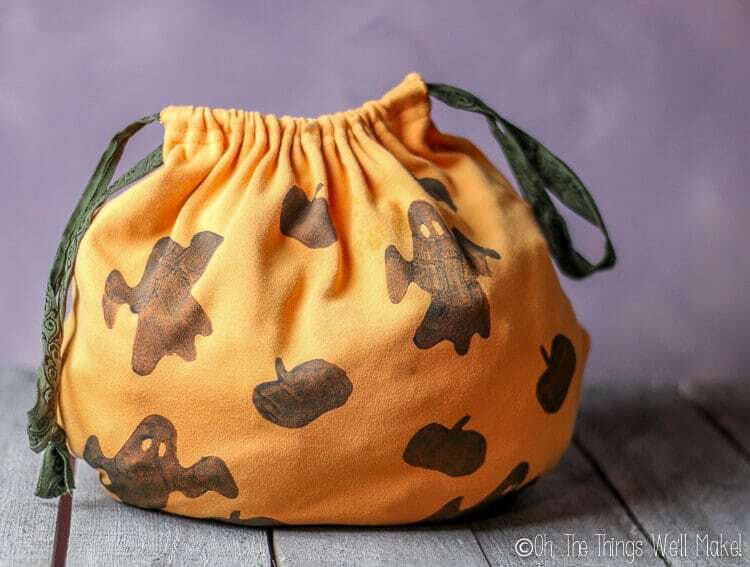 If you haven't wanted to make a snowflake drawstring gift pouch, though, or a trick-or-treat bag, you may have missed the concept. Upcycling t-shirts into bags, and sleeves into smaller pouches, is something so easy to do, and it can be so useful in so many ways. It's super simple, and anybody can do it. Don't have a sewing machine? It's only one sleeve, so you could easily hand sew them in a pinch. Seeing as I have a couple of projects on the blog already that use the idea, I figured that it was silly to have to keep writing up the same instructions over and over again. This merits a post of its own! As you may have noticed before, I love to repurpose lots of different things, but old t-shirts are probably my favorite material to work with. The edges are hemmed in a way that forms a handy tube which is perfect for easily making drawstring closures. 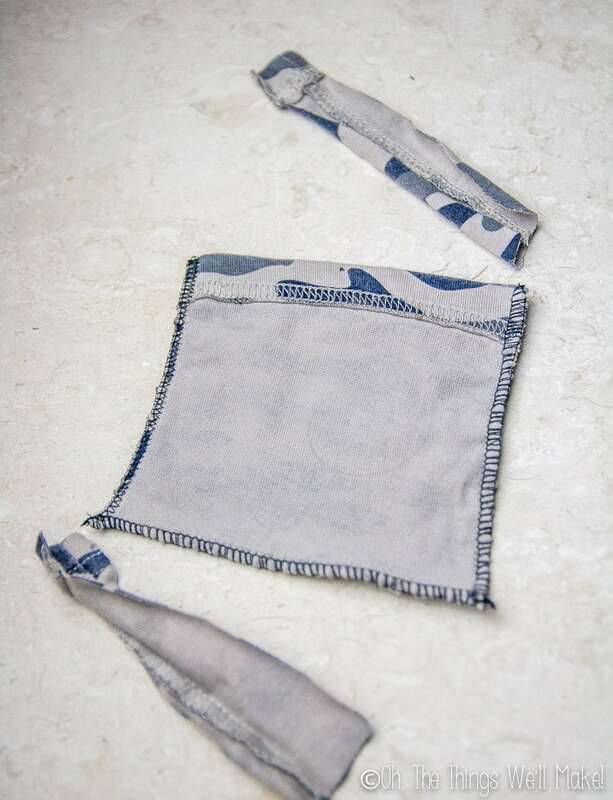 In literally less than a minute, once your sewing machine is out, you can have the sewing part finished for converting both sleeves of a t-shirt into 2 drawstring pouches. How to make a drawstring bag in less than 10 minutes! 1. Turn your sleeve inside out, and cut it into shape, just slightly bigger than you want your pouch to be. If you are making a larger bag from the bottom hem of a t-shirt, either cut the top part off (if you want the bag the width of the t-shirt) or cut two pieces just slightly larger than you want your bag. This is to account for the seam. 2. Sew down the side(s) of the sleeve, if you have cut it. If the sleeve is square enough, you can leave the sides as is. 3. Sew the bottom seam closed. If you have a serger, use that to have tidy seams. If not, I like to use a zigzag stitch and cut off excess fabric neatly and carefully. I squared up all of the sides before sewing the bottom hem to show you how it can be done. Leave the finished hem at the top untouched! 4. Turn the sleeve/pouch right side out again. You have finished sewing! Here you can see the small slits in the hem enclosure on either side of the seam. 6. 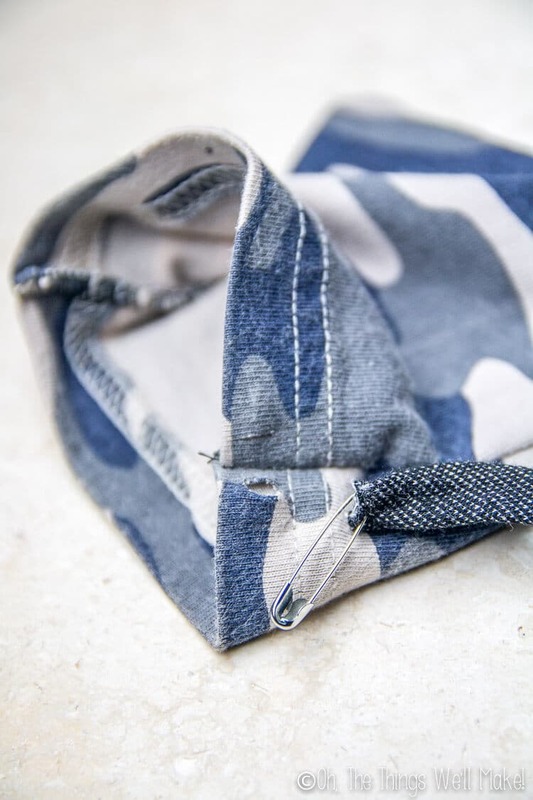 Using a safety pin to help pull it through, take the cording or ribbon that you want to use for your drawstring, and pass it through the hem enclosure. You'll start on one side and pull the string out the hole on the other side. You'll then need to pull the cording through on the other side back to where you started. Here you can see how I have pulled the cording through the drawstring enclosure. This is enough for a single drawstring pouch. 7. If you are making a double drawstring, you'll have to repeat the process with another cord using the holes on the opposite side. To make a double drawstring that is easily closed, you'll need to use another cord, pulling it through the enclosure from the opposite side. 8. 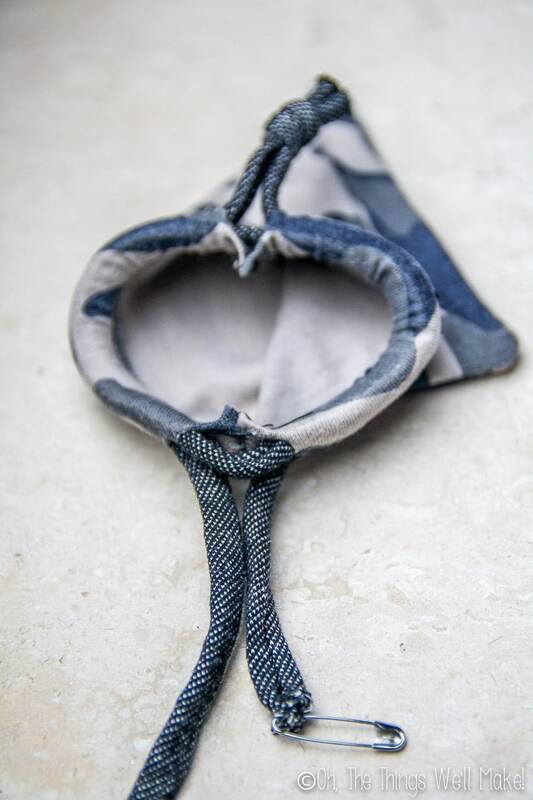 Tie the ends of the cord(s) together, and you have finished making your drawstring pouch! 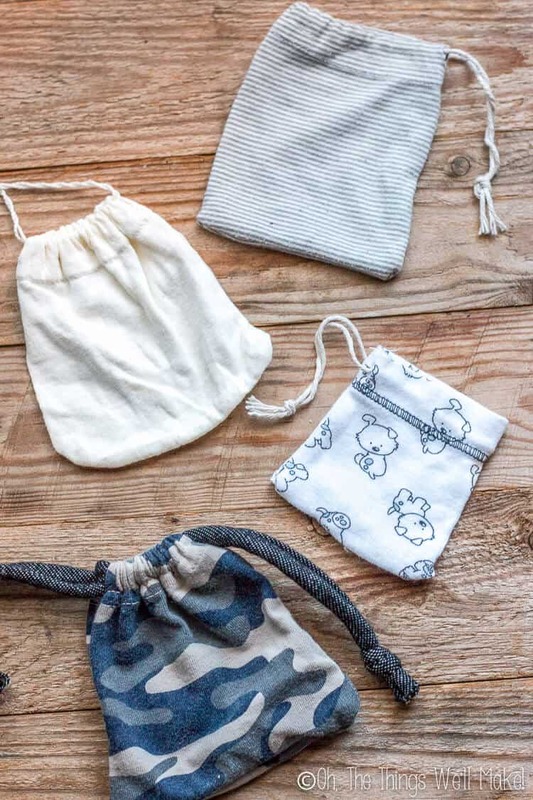 Homemade drawstring pouches are super handy to have on hand. I like to use them to organize all sorts of things all over the house. I made lots of pouches out of my son's old clothes and used the ones with fun, bright colors to organize a lot of his smaller toys. You know what I'm talking about, the tiny bouncy balls and little party favors that just seem to accumulate all over the house. I have pouches to hold decks of cards together so none of the cards get lost! 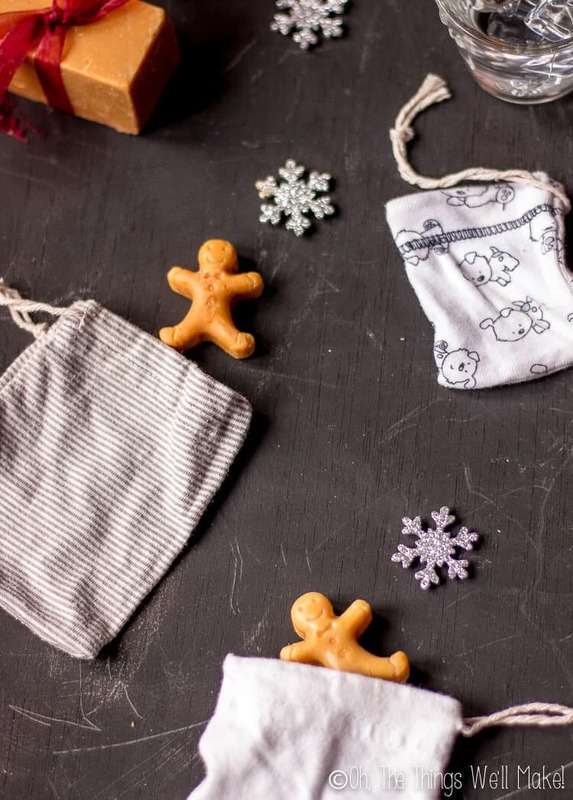 These pouches were made to hold homemade gingerbread soap as a cute holiday stocking stuffer. 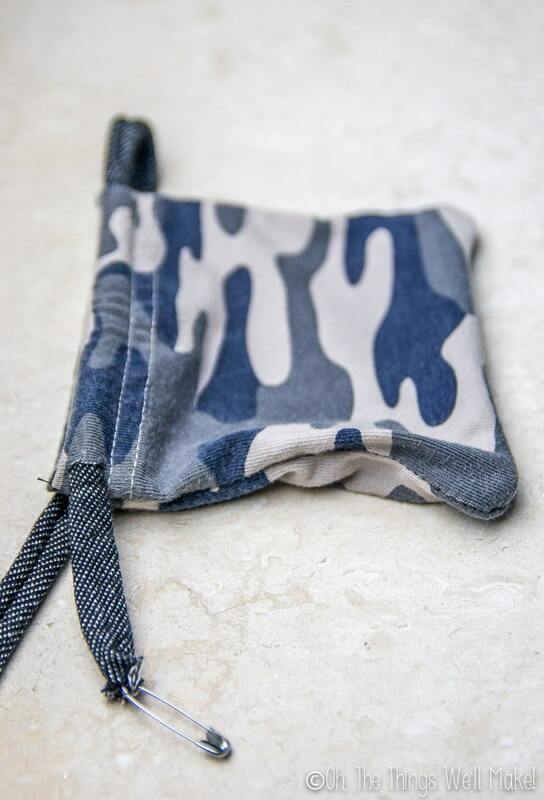 If your pouches are plain, you can decorate them with fabric paint. 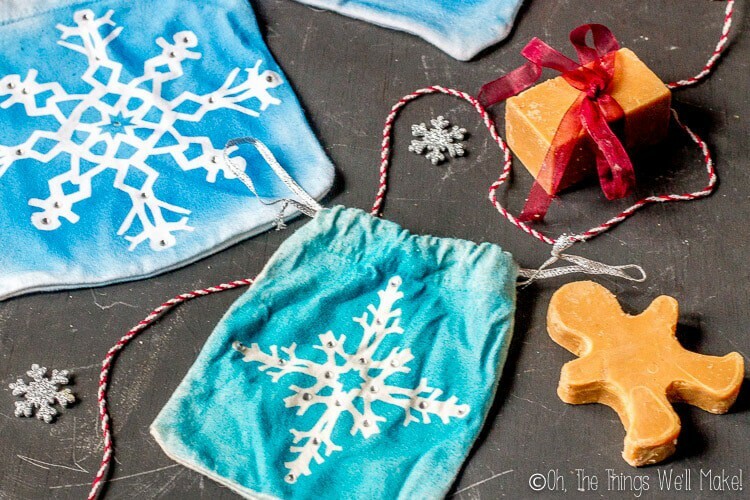 These snowflake gift pouches can be easily made using freezer paper and fabric paint. Using the main part of the shirt, rather than the sleeve, you can make larger bags for organizing bigger things like holding together pairs of shoes or rollerskates. Ironically, my daughter had to empty out her fry daddy yesterday n ask me where to dump her old oil. I had her using an empty Tide pod container for her lint from dryer, cuz she was walking all the way to kitchen trash can to throw her lint away, so I had her sit container on shelf n laundry room. I just luv recycling. Anyways told her to pour oil n with lint, we probably could make firestarters with it. And I found ur site!!! Sorry to take so long to get back to you. I just got back from a needed vacation in which I didn’t have an internet connection. I love your teabag idea! It could also be used to carry small snacks such as nuts. you could repurpose old child or adult size Tshirts, especially one that have printing or logos on them to be stuff bags for backpacks or luggage! Cut Tshirt just below sleeve level, sew the raw edge shut, and run cording through the bottom hem. Luggage organizers are expensive, and I seem to be TSA’s favorite traveler when it comes to baggage inspection; I can use the re-purposed shirts to pack undies, bras, hose, and even larger items in. I didn’t get stopped the time I travelled alone.